I remember going to sleepovers as a kid, and staying up into the wee hours of the morning trading scary stories and urban legends in hushed tones with my friends. We’d swear up and down that we knew someone who knew someone who knew the girl whose boyfriend was murdered by the hook hand killer. We’d retell local legends, and stories we’d read in Scary Stories to Tell in the Dark.The tales were short and sweet, getting to the good stuff quickly and allowing for the storyteller to embellish for maximum effect. It spawned an entire generation of horror fans, including authors John Brhel and Joseph Sullivan, who paid homage to the Scary Stories collections with their newest book, At the Cemetery Gates: Year One. The following aren’t short stories so much as they are digestible suburban fables. 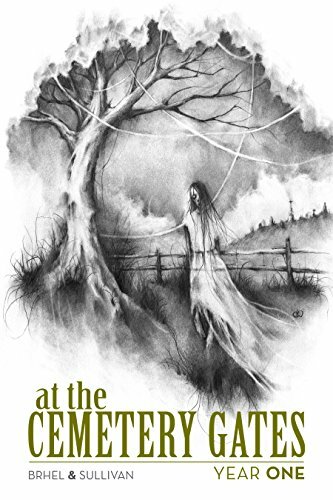 Cemetery Gates Media presents a collection of fourteen twisted tales clocking in at 168 pages of consumable bites of horror and dark fiction, written in the very style that made Alvin Schwarz’s tales so popular two decades ago. Rather than setting everything up neatly like a regular short story, Brhel and Sullivan condense their stories into compact vignettes that are ready for retelling around a campfire, or in a bedroom late at night. The Girl With The Crooked Tooth, a thoroughly eerie homage to Edgar Allen Poe, complete with a creepy dude with an odd obsession with a woman. I don’t like dental stuff, so this one really got under my skin. The beautiful prose and unsettling imagery stuck with me. New Year’s Eve, What A Gas!, about a simple mistake leading to catastrophic consequences. If you like the stories that play on fears of being killed at random, for no good reason, this is sure to titillate. Considering that I couldn’t find a bad thing to say about this collection and found it to be even more enjoyable than their last anthology, I give this book the full 5 stars. Many of these stories are trope-heavy, but that’s how good lore works. It follows a basic template, and works as a means of expressing universal fears in American society. Anonymous murderers, poison in our food, and systematic conspiracies that affect the marginalized are all things that many of us worry about. Urban legends synthesize those apprehensions into morsels of dread that serve to remind us that death awaits us everywhere, at all times. I’d heartily recommend At The Cemetery Gates to readers who want a little something to nibble on before bed each night, and to young horror fans who want something juicy to regale to their friends between classes. Find it on Amazon.